Importance of mRNA localization and function of mRNPs. Advantages of using fluorogenic FIT probes to visualize mRNPs in vivo and in fixed specimen. How super-resolution microscopy can identify factors required for mRNP biogenesis. All mRNA molecules recruit specific proteins to form ribonucleoprotein complexes (mRNPs) . Composition and localization of many mRNPs change dynamically from translation to decay. Microscopic techniques with high spatial and temporal resolution are invaluable for studying mRNP biogenesis. We have developed new tools based on fluorogenic forced intercalation (FIT) probes for RNA detection, quantification and interference in biological samples. The probes contain a thiazole orange (TO) dye introduced at a position normally occupied by a nucleobase. Upon binding to target nucleic acids, the TO dye increases its quantum yield and brightness substantially (greater than10 fold). 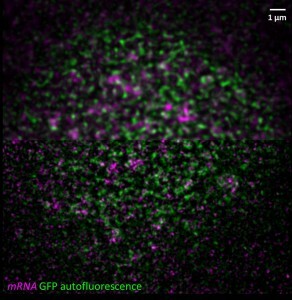 These probes detect mRNA in a rapid, wash-free FISH setup using conventional wide-field microscopy. It is an ideal tool for RNA localization screens . Nuclease resistant FIT probes containing a locked nucleic acid adjacent to the TO dye are bright and contrasted enough for use in live imaging. These probes can also be designed to target functional elements of RNAs to test the role of those in RNP biogenesis . Absorption and emission spectra of TO are sufficiently different from EGFP to enable high sensitivity and specificity RNA-protein co-localization analysis, even with super-resolution, to study the RNA interactome (Figure 1). LNA modified FIT probes are excellent subjects for STED microscopy as duplex formation greatly increases their fluorescence lifetime.